Need a fast lunch or after school snack idea? 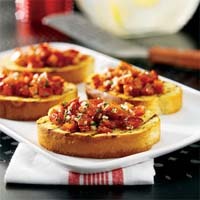 Give this quickie bruschetta a try. I used to make this for the girls when we were homeschooling. It is also great with a bowl of soup or a nice healthy salad. Place drained tomatoes in small bowl. Add olive oil, garlic, basil, salt and pepper. 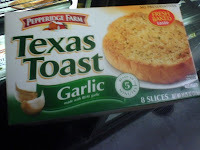 Toast one side of Texas toast on cookie sheet in oven, per directions. Turn over and top toasted side with tomato topping. Sprinkle with cheese. Bake until brown and cheese is melted, about 5 more minutes. Cut into 2 or 3 slices to serve. 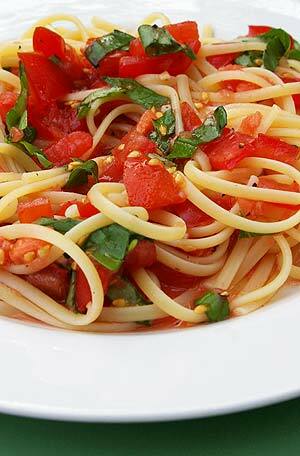 Remaining topping can be tossed with hot pasta as a fast sauce. Cook pasta according to package directions. Drain and reserve a little pasta cooking water to loosen up the sauce if needed. Immediately toss with tomato sauce. Add a little pasta water if needed. Taste for seasonings. Top with grated Parmesan cheese.